From the publisher: Since inheriting her mother’s sandwich shop, Nora Charles is more about hot grilled paninis than cold-blooded murder—until her sister Lacey is arrested. The victim, an esteemed art collector and Lacey’s bullying professor, was stabbed in the heart. Apparently, all over a lousy grade. 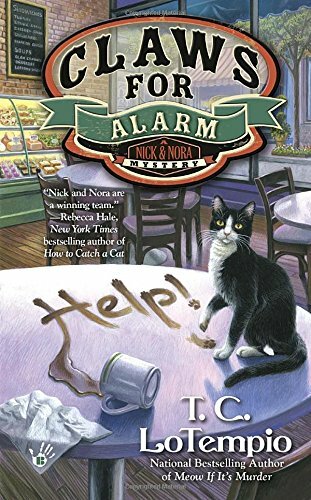 Last year Nick and Nora made their debut in Meow If It's Murder as a crime-solving team to be reckoned with, and they're back with their second adventure, Claws for Alarm. When the story begins Nora is happily running her sandwich shop while still attempting to locate Nick's missing owner, PI Nick Atkins. A new lead promises to take her near her Aunt Prudence's house, but when she calls her aunt to make plans for a visit, she learns that her estranged sister Lacey is being accused of murdering one of her art professors. The hunt for Nick is forced to take a backseat to clearing Lacey's name, but Nick and Nora have no idea what they're up against. Nora goes undercover and meets a cast of shady characters, all whom had reason to want Professor Pitt dead. Nick once again uses Scrabble tiles and pieces of paper to communicate clues to Nora, and ends up being a furry hero when Nora finds herself in extreme danger. A love triangle is in the works as the lead detective on the case ends up being a familiar face from Nora's college days. I adored the scenes between Aunt Prudence and her childhood friend Irene, who is staying with Prudence while her house is being fumigated (long story). Their squabbling was a hoot. This complex mystery is filled with twists and turns and even included a brilliant tie to PI Nick's disappearance. By the end his fate is still in question, but the set up for book 3 is purr-fect. Long live Nick and Nora!!! Sounds very interesting!! Thanks for recommending, Mudpie! Claws for Alarm sounds like a great cozy, and the cover art is awesome. Thank you for the giveaway. Oooh, Yay, two of my favorites kitties and cozy mysteries. I've been waiting for the next installment in this series - Meow if it's Murder was terrific - and it sounds like it'll be terrific, too! Nick and Nora make a super pair. We don't actually want to enter this giveaway because we're overflowing with hard copy books as is, but we had to comment and say this may be the cutest kitty cozy cover we've seen in a very long time! Sounds like a lovely series! Always looking for a good read, thanks for the heads up. Claws for Alarm sounds like a great cozy read. Love the cover art. Thank you for the giveaway. This is a great series. I look forward to this latest installment. I love Nick and Nora! Thanks for the chance! Thank you so much for another great cat book giveaway. I read the first book from this series and LOVED it. Must get my paws on this one, too. I would love to read this series, it sounds like a lot of fun. thank you for all your kind comments! We'll be writing Nick and Nora as long as Berkley keeps wanting to publish them!